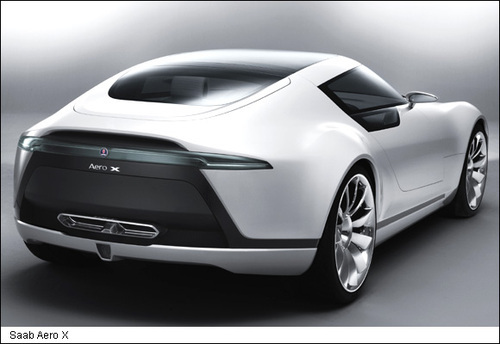 "Saab is delving into its past to reshape its future with a radical concept car aimed at redefining the brand. The sleek two-seater Aero X was welcomed amid 55 tonnes of ice imported from Sweden to reinforce the General Motors-owned brand's history. The Aero X harks back to Saab's aeroplane history to create a look-at-me concept car designed to reassure people the troubled Swedish brand has a prosperous future. 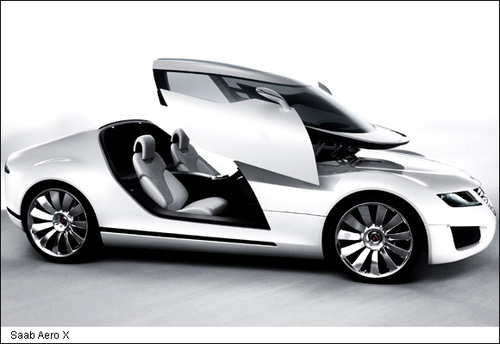 A radical cockpit-style canopy negates the need for doors, instead raising electronically to reveal a futuristic two-seater cabin. There are also no windscreen wipers, with a special coating on the screen designed to keep occupants seeing clearly in the wet." GM HQ will not let Saab build a cool car like this. They will 'badge engineer' it into such mediocrity that you might as well call it a Pontiac.